When Marcus Lemonis, CEO of Campingworld/Good Sam, came to the grand opening of its Jacksonville operations two years ago, he held a raffle and gave away tremendous prizes to virtually everyone who came out that Friday evening. And he made us fall in love with him. We almost did not go to that event. It had started to rain, and the open house started during rush hour. (Traffic is horrible in Jacksonville at any time, but especially at rush hour.) But, we went. We nibbled on whatever snacks that were gluten-free. And we found a Fantastic Fan (an overhead exhaust fan) to replace one that didn't work in Baby, our first RV. We were ready to check out, but I checked the time first. It was only 15 minutes until Marcus would begin the drawings for prizes, so we decided to wait. Maybe we would get lucky, I told Jim. Maybe we would win (say) $50. A few minutes later, Jim's name was called. I went up to Marcus, and he gave us our gifts. The retail value of the satellite dish, fan and installation was more than $2,900. Wow! A few months after we bought Junior (our current RV), we arranged to have the gifts installed. About the same time, we quit U-verse home TV service, and subscribed to DISH satellite service, opting for receivers that could be used in the RV. We have transported the receiver to the RV several times, but I think we were only successful in watching satellite RV once, because the other times we forgot to bring the remote--just like we did this week. You can't watch satellite TV without the clicker. Because we (again) forgot the remote, Wednesday seemed an opportune time to purchase a receiver and install it permanently in the RV--especially since we had received a flyer last week from Campingworld that it was on sale for only $75. Jim spent the afternoon installing the receiver, which allows you to use your own hard drive to record programs. We brought our hard drive with us, and we are able to not only record programs, or watch them live, we can also watch shows previously recorded. Just like at home. Just like at home...watching our DVR. Why did we buy the receiver? 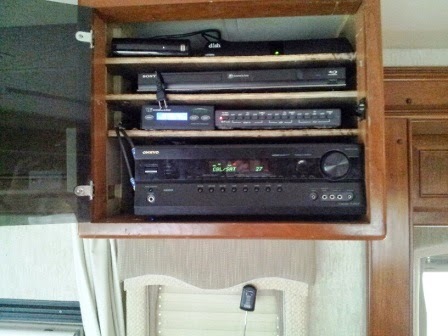 It is a tight fit to put the receiver into the audio/visual cabinet. Now we don't have to go to that trouble any more. 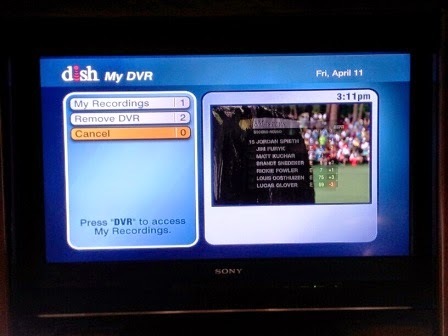 Plus, at the end of May we are going to discontinue DISH services...cut the cable, so to speak. We have Chromecast on two TVs and Roku on the third, with subscriptions to Netflix and Hulu+, so theoretically we will be able to watch whatever we watch now, just without the expense of DISH, whose costs have escalated over the two years we have had the service. Watching TV in this manner will require adjusting our viewing habits, but we will get used to doing that, just as we got used to only have two receivers and not being able to record as many shows as we had when we had U-verse. Less TV is good, in my opinion. But, when we are on the road, we can subscribe to DISH on demand, one month at a time. If we are out for a short period and can get good over-the-air TV, we won't bother. But we will have the option. It's always nice to have a choice. So, thank you once again, Marcus; thank you Campingworld. We appreciate the satellite dish you gave us. P.S. We really love Marcus. He's a dynamic business person. Watch his show, The Profit, on CNBC. You can even watch episodes on demand online. In the show, he uses his own money to buy businesses and turn them into much more than the owners had ever dreamed. But, sometimes the deals don't work out, and he walks out if the owners don't live up to their part of the bargain. One of the businesses he bought, Automatch, just expanded to Jacksonville. April 8, 2014--We are on the road again. We haven't gone too far, just to the Orlando area. We're staying at the Thousand Trails Orlando, which is a misnomer, because it is in Clermont, not Orlando. We stayed here once before. Jim has his 60th high school reunion this weekend. He'll be the "youngest" at the reunion, since he was only 16 when he graduated from Boone H.S. 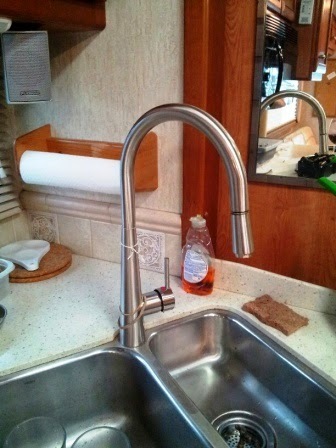 Last week, Jim installed a new kitchen faucet in the RV. Nice! I like tall faucets. This one has a pull-out sprayer at the end of it. The trip up here was a bit bit lonely without Charlie sitting on my lap. Xena spent most of her time sleeping on the bed. That's what she does mostly...sleep. She is the same age as Charlie. She seems to be in pretty good health, except she is slowing down a lot. No interest in chasing laser lights, and even little interest in exploring out in the yard. But she's affectionate now, and we are appreciating her. This trip we decided to bring one of our DISH receivers. Jim got it hooked up, then discovered two things: (1) He (he was in charge of the satellite stuff, not me!) forgot the remote control; and (2) the big TV didn't want to power up. He thinks we might be able to change channels through the receiver itself, so he's trying to hook it up in the bedroom, where we have a small TV. It's always something. We don't have any definite plans for this week, other than the reunion, having dinner with Mike and Susan, and going to IKEA. (That's like going to an amusement park.) Oh, and having dinner at one of the Vietnamese restaurants on Colonial Drive. (That's always a treat.) We may also go visit a friend who was Helen's neighbor for many, many years. The RV resort has a catch-and-release fishing pond. It also is located on a large lake with a fishing pier. 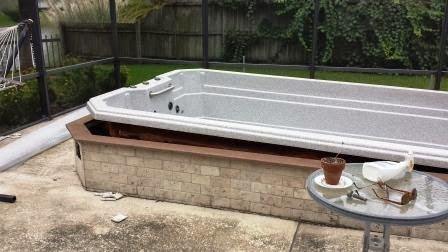 We intend to explore that later, as well as its other amenities, such as a pool table and miniature golf. Goodbye, Charlie. We love you! March 19, 2014—The time finally came. I had postponed it for weeks, maybe years. But today, after yet another incident of uncontrolled bladder, I took Charlie into the vet and said my final farewells, crying all the time. The vet, of course, gave me options. But really, there were none. Charlie was 16 years old. She said he had a bladder infection, which could be cured, but would most likely recur. She said he had chronic kidney failure. And thyroid failure. And heart failure. She could see it in his skin and bones. He only weighed 6 pounds 13 ounces, down more than two pounds from three years ago. 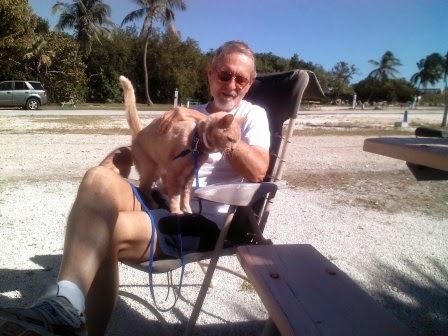 I saved Charlie from the animal shelter in Palm Beach County a couple months after I moved to south Florida in 1998. He was such a tiny thing! Hardly more than a handful. I didn’t want a big cat, and I was right in believing he would never grow big and fat. I picked him out because he reminded me of my little dog, Poochi. I still cry when I think of having to put him to sleep. I guess I will cry when I think about Charlie or see a cat that looks like him. Jim always accused me of treating Charlie like a dog. I guess I did. I petted him, not stroked him. I expected him to be a companion to me. And he usually was. I gave Charlie a friend, Xena, a month or so after I brought him home to live with me. I thought (erroneously) that a cat should have a companion. Wrong! Dogs need a companion during the day, but cats don’t. They are independent. Charlie and Xena never got along really well. Despite being “fixed,” Charlie would try to ... well you know. And Xena didn’t like it. She let him know. Charlie was a good cat, though. He was especially good to Helen, Jim’s mother, who lived with us for six years until she died at age 97. Helen would go to the Senior Center every day, and would return at 1 p.m. Charlie would be waiting for her. He would walk her to her room, and then, when she laid down for her afternoon nap, he did too. They performed the same ritual every night. Usually it was in her bed that he slept. I called Jim from the vet when I made the decision to put Charlie to sleep. I simply said, “Dig a hole.” We both cried as I said it. When I got home, the grave was ready. He dug it just outside of the porch. He gently placed Charlie in his final resting place. As he was filling the hole, I said, “That’s where we ought to put your mother’s ashes.” Jim thought it was the right thing, too. Helen’s ashes were buried in North Carolina, at the gravesite of her husband, Jim’s father. But we had saved some. We had talked about strewing them on the pond out back of our house. She loved sitting on the porch and watch the ducks and geese and other wildlife. Something has held us back from doing that, however. I guess strewing her ashes on the pond just didn’t feel right. But burying them with Charlie did. We both cried some more. I don’t think either of us had cried ver much when Helen died. It wasn't that we didn't love her. But the tears didn't flow then. But now, we put her and Charlie to rest together. And the tears came. Charlie and Helen are taking care of each other. I think I will cry some more tonight. I didn’t think I would. After all, Charlie was only a cat. Not a dog. But I loved him. And Jim did too. No more Charlie stories when we travel. Goodbye Charlie—and Helen—we miss you already. February 21, 2014--The main purpose of our week's vacation was to learn how to fish. And that's what we did today. Did you know that fish can smell? I didn't. I knew they could see; that's why you put attractive bait that they want to eat on the hook. But smell? Well, it makes sense. Rodney Smith, the publisher of a statewide fishing magazine distributed free at bait shops, was the main presenter, along with John Detmer, a long-time angler and owner of a bait and tackle shop. Smith used to be a fish guide; he has won recognition for hooking the biggest snook on a certain type of line. He knows what he is talking about when it comes to fishing. The bait method Smith and Detmer suggest using is called the 3-S method: sight, sound, and smell. When all three are used together, supposedly fish will jump into your net. Well, maybe not. But using a lure that is attractive, adding scent (either with a scent plug or spray), and also adding a rattle within the lure makes the lure more alluring, since it immitates real bait fish. And did you know that a smaller hook is better than a bigger one? 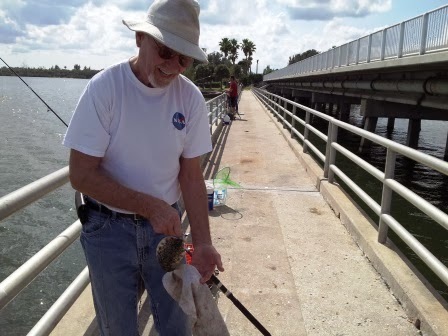 And that you can actually catch a very big fish on a lightweight monofilament line? I didn't know these things, but I do now, and I can't wait to try them out. Part of the fishing school was inside an auditorium at a conservation center on Melbourne Beach. After a couple of hours, we went down to the beach. Unfortunately, the wind was fierce and clouds were overhead. Rodney and John demonstrated how to bait hooks and how to cast into the surf, using a 12-foot fishing pole. But the weather was too bad for any hands-on experience, assuming some was planned. Fishing is like any other sport: You have to learn how to do it. Sure, you can just throw out a line and hope for the best, but it's better if you have at least a little knowledge. The fishing school gave us that. So, tomorrow, if the weather is better, perhaps Jim and I will head out to the beach and try our hand at surf fishing. I can't wait. 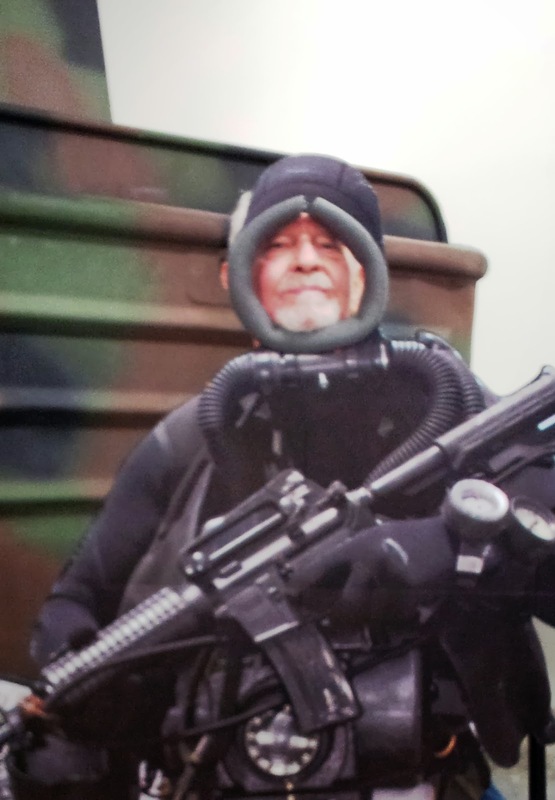 Feb. 20, 2014—Do you remember the movie, Frogmen? I do. It was about the Navy’s Underwater Demolition Team (UDT), the predecessor to the Navy SEALS. I was pretty young when I watched the movie starring Richard Widmark, but I remember thinking how cool it was to swim underwater. Scuba diving wasn’t yet a recreational sport, if my memory is correct. 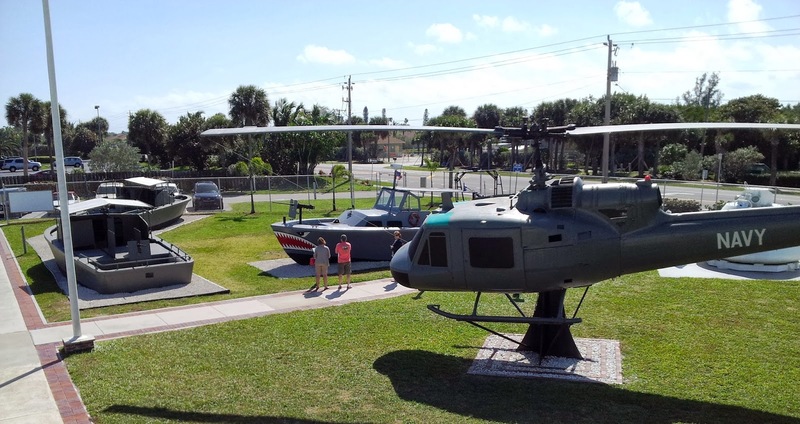 Today Jim and I traveled down the road to Fort Pierce, Fla., where the UDT SEAL Museum is housed. Quite interesting. The museum tells the history of the UD teams and SEALS and have a lot of artifacts, including weapons as well as uniforms and equipment, used by these brave sailors. 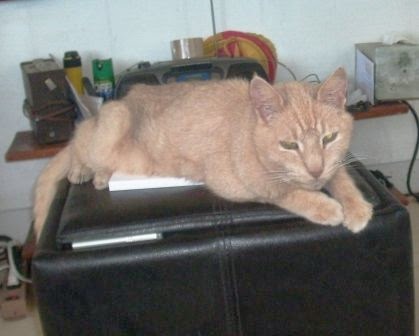 Feb. 20, 2014—Charlie, our 16-year-old-on-death’s-door cat, is still around. Tuesday afternoon we brought Junior (our motorhome) to the house so that we could load and leave on Wednesday morning. Charlie, who almost never goes into the front yard, saw (or heard) the motorhome and sat in the middle of the driveway, watching us go in and out of the house with our belongings. 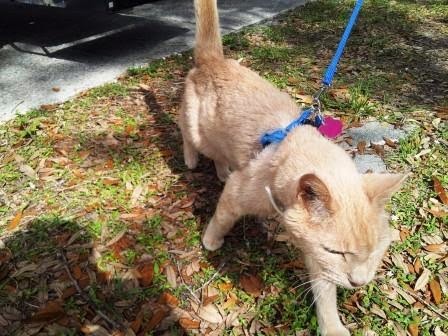 And, like a puppy dog, he started following us—into and out of Junior! We couldn’t get over it. I think he is confused (probably a little dementia). When we were ready to leave Wednesday morning, of course, he took off and hid. We were smart, though, and had closed doors and locked the outside cat door, so he couldn’t hide too well. We found him under our bed. He came out not too reluctantly. Xena was no problem, either. She wasn’t as happy about going into the motorhome as Charlie, but once we got underway, they were both fine. Charlie spent a lot of time in my lap. Xena slept on the bed. 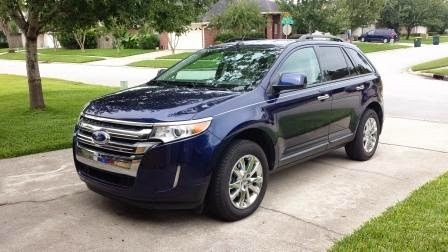 They may be Reluctant RoVers, but they are coming around. P.S. Charlie seems to be doing well, and actually may have gained a little weight. I guess it isn’t his time yet. Feb. 19, 2014—The never-ending sage of our electrical problems continue. 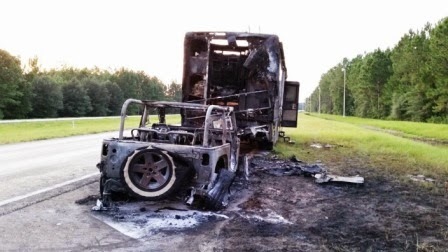 Ever since we purchased this motorhome, we have had intermittent electrical problems. Last trip out (down to the Keys), Jim thought it was the electrical cord. Then (just before spending $150 for a new cord), he found the real cause: bad brushes in the reel that winds up and stores the cord. He disconnected everything; temporarily fixed the problem; and determined he would replace the brushes (some copper doohickeys) when we got home. He thought everything was OK, but then suddenly we had a problem with the inverter, a device that allows you to get 110 electrical power in the motorhome when using batteries or on the generator. The inverter lit up like a Christmas tree; it did not show any charging. Jim figured that would sort itself out once we were plugged in at an RV park. In fact, really wrong. When we got to Vero Beach tonight he plugged in the cord and puff! (Literally.) Everything shorted out. And we still had a Christmas tree for an inverter. No power anywhere. 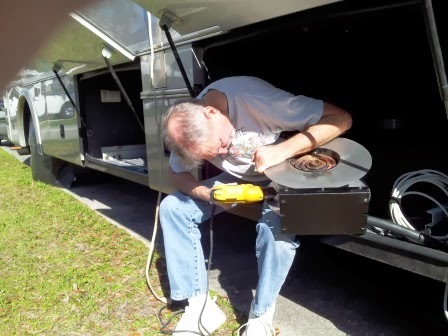 After testing everything, he finally decided that he would take apart all of his work, disassemble the entire reel, and attach the cord directly to the motorhome (instead of going through the connection in the reel). Don’t get me wrong. We like our motorhome. It is luxurious. It is large. It is comfortable. But it is a pain the you-know-what. Luckily, my husband can fix almost anything. 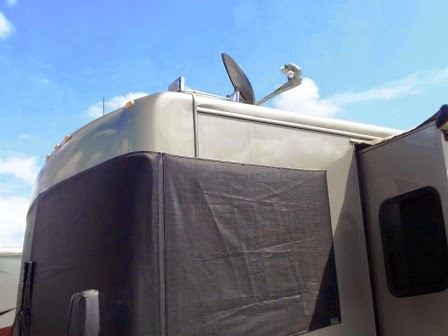 We still have some things to fix that we knew about when we purchased this home-on=wheels—like the automatic awning. And we have some updating to do. We purchased a very nice tall kitchen spigot with a pull-out sprayer. He may have time to install it while we are here. We also bought a bidet to put on the toilet. Those are little projects, which should be easily accomplished. Should be. Easy to say. We’ll see if they are. Later today are off to a Navy Seals museum in Fort Pierce. Tomorrow we attend our fishing clinic. And the rest of the week we plan to catch fish. 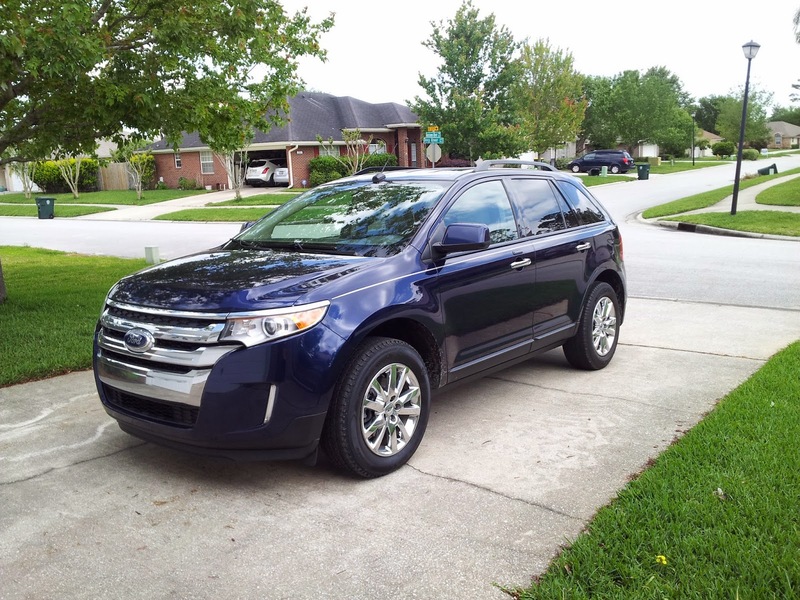 We live in mostly sunny and warm(er) Florida, so by and large, we ignore the advice and articles on winterizing RVs. Last week, the polar vortex extended its cold breath as far south as Florida, and we experienced a hard freeze. For two or three nights, the temperatures dropped below 32 degrees. I believe it was Tuesday morning that I awoke to 25 degrees. Last weekend, when it was warm and sunny, I saw the weather forecast and asked Jim about safeguarding the RV against frozen pipes. He hadn't given it much thought (since this is something we almost never have to think about), but then considered that it would be a good idea. He drove down to Junior. 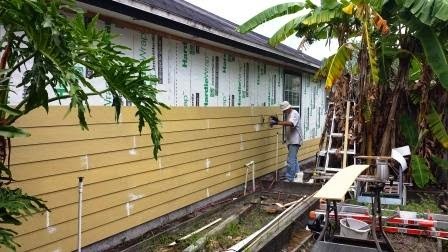 His winterizing effort included turning the propane furnace on and setting the thermostat to 40 degrees; emptying the hot water heater, and turning on the faucets to get the water out of the pipes. 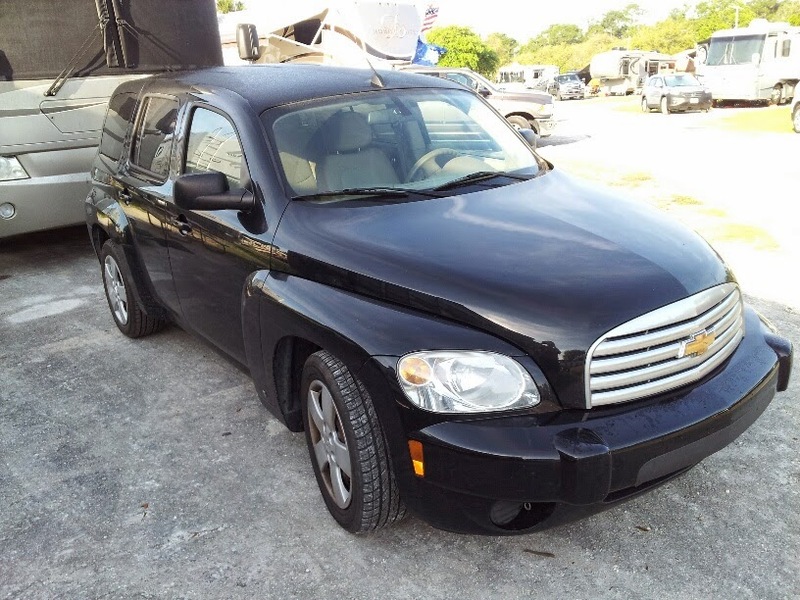 he also removed the windshield water reservoir, since it did not have an anti-freeze agent in the water. 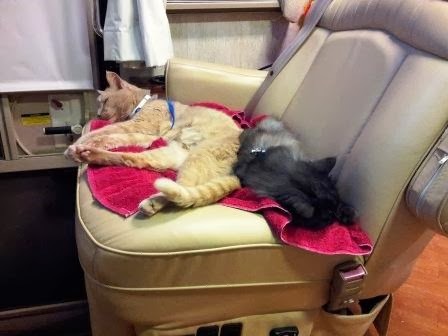 Yesterday we returned to the RV to undo his efforts, since the freeze is now over and temperatures are in the 70s. 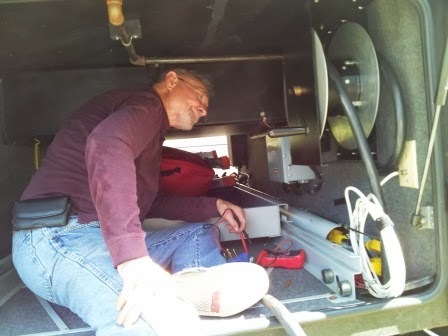 As Jim replaced the thermostat on the outside of the RV, he asked me to turn on the bathroom faucet to fill the hot water heater. I did. Water flowed for several minutes. I decided to go ask Jim how long he wanted me to run the water. As I walked through the galley, I saw water streaming on the floor! My first thought: broken pipe! Yikes! That's all we needed. Jim came in to look. I had turned off the bathroom faucet, but I didn't know he had left the kitchen faucet open. The kitchen cutout (counter top that fits over the sink) was over the sink, the faucet (unknown to me) had been spouting water over the counter and onto the floor! What a mess. A lot of water. The floor is vinyl planking, so it wasn't damaged. And a good mopping never hurts. 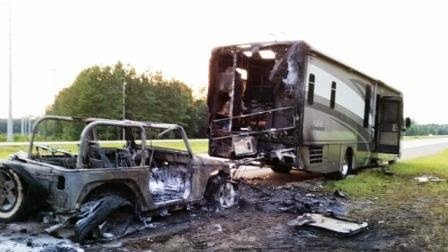 The moral: Think ahead if you have to winterize an RV. And close the taps.